Czechoslovak-American Marionette Theatre (CAMT) re-imagines its perennially popular "Johannes Dokchtor Faust, a Petrifying Puppet Comedye," translated and directed by Vit Horejs. 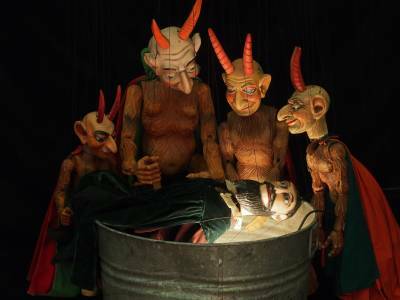 The story of the learned Johannes Faust, who sold his soul to the devil for ultimate knowledge, is staged with age-old technical tricks of Czech puppetry, including fire and thunder, hellish gargoyles and underwater creatures. A classic of the Czech marionette repertoire, it traditionally contains satires to make fun of a king or a local mayor. The company's adaptation was initially developed in 1990 and its topical references will be updated for current times. The script is the first definitive American translation of the classic Czech text by the author known today only as "A.B." 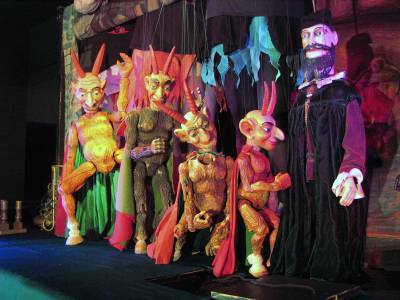 The main Mephistopheles puppet, about 26 inches high and about 100 years old, was fashioned in Kladno, Bohemia by Karel Krob, a mason and shoemaker. There are three copies of Mephisto, differently-sized, used to make him shrink and grow as he gains and loses power. 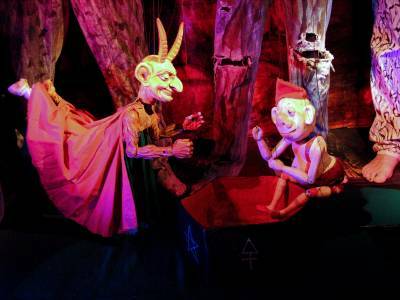 Faust is a copy of a folk puppet originally crafted in a Czech-American company over 200 years ago. The balance of the 20-or-so puppets in the show come from the troupe's repertory, notably century-old Czech puppets discovered in 1990 in a hidden storeroom at the Jan Hus Church on East 74th Street. Recommended for ages 6-106. Check out Dates for: "JOHANNES DOKCHTOR FAUST, A PETRIFYING PUPPET COMEDYE"